Article 1 of the Charter of Fundamental Rights of the EU (2000) states that “Human dignity is inviolable. It must be respected and protected”. In a highly information and communications technology-based world, this fundamental human right and basic ethical principle is facing an increasing threat. The time during which I wrote The Sun Thief was obviously a breathless climb up a steep learning curve. Encountering chemtrails, geoengineering, aerosol weapons and such through research yielded so much data. Each discovery felt like a landmine, each landmine blew up in some way…in my heart, in my head, in my hope for the future. They were already paying attention, they knew the science, they understood the science not because they were that much smarter than everyone else but because it was a way of looking at the world that interested them. Digging continued and continues to yield data like an unstoppable avalanche, like the falls at Niagara. However, there is only a thin slice of the population that wants this information in this way. New information presented just to these people is, what we called in my house, ‘preaching to the choir.’ The choir was already convinced. We needed to get the other ninety percent on board and if not on board exactly, at least aware. I try in every interview I give and in every article I write to talk about Everyman. Fictionalizing my story was one of the ways I hoped to reach the broadest possible audience. Humans learn through story. I think that’s one of the reasons I’ve had to fight the uphill battle against invisible forces meant to bury this story. I lecture, attend activist’s congresses, and continue to write articles trying to find better, more compelling and more interesting ways to reveal what’s happening to us. Getting beyond the choir. I want to talk to everyone I can on the other side and when people ask me what they can do, that is my answer. Help raise the consciousness. That’s all we need. Speaking to my publisher in Germany this morning confirmed for me that all of us who are trying to get beyond the choir are bringing the same things: transhumanism, Morgellon’s Syndrome, and all of the illnesses with which we find ourselves and our children saddled. Our children do not know that the way they feel is abnormal. They are all environmental. Every one of these dis-eases and so many more. They are attacks, deliberate assaults on us. Lingering, non-specific respiratory illnesses? Now the third largest killer in the United States. In fact, there are a handful of categories with life-threatening information within each, all of which is so important, that when I gave an interview on the subject in Germany in mid-August, the task of boiling everything down to the most essential was overwhelming. Physiologically, it all falls under the heading of critical. And, the fellow who translated The Sun Thief into German (contributor Harald Kautz-Vella) recently sat with a woman at a hospital in Berlin and talked to her about her Morgellon’s Syndrome. I have included a set of photographs of some of the typical presentations of Morgellon’s at the bottom of the page. They are graphic. God help me, this is the part I like writing about the least. However, we all have children. They deserve to have a life. The attempted ‘war’ in Syria provided the administration with the opportunity to state publicly that spraying poisons on your own people, or any people, is absolutely abhorrent and forbidden. I will not stop reminding the public of that. President Obama, Sept. 4: First of all, I didn’t set a red line; the world set a red line. The world set a red line when governments representing 98% of the world’s population said the use of chemical weapons are abhorrent and passed a treaty forbidding their use even when countries are engaged in war. Before I go on, though, I want to state here and now that it is most certainly NOT the Chinese and the North Koreans and the Russians and all those other bogeymen we love to point to who are responsible for the heinous medical experiments raining down on us and the deliberate physiologically wrenching transformation we are undergoing. It’s all of the above including the United States of America. Do not kid yourself. These programs meant to use us as medical guinea pigs and insinuate chips and metals and biologicals and aerosol vaccines and viruses and sub-micron-sized fibers and pseudo-DNA into our very bodies? That’s them and US. Never forget that or we’re sunk. The other stuff is a distraction. The entities conducting this slow-kill program are a hyper-malevolent blend of corporation and government/military which lacks a center…read: the buck just doesn’t stop because there is always someone further along in the circle to blame. 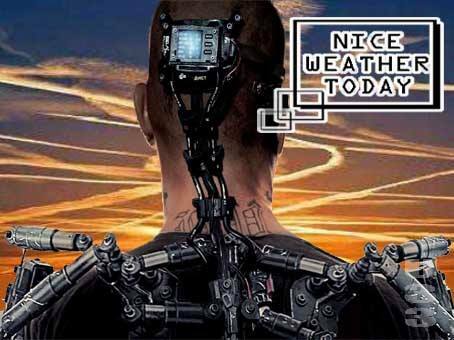 One of the reasons there is always someone further along to which we can point is that the sheer volume of biological/medical experiments being performed on us from the atmosphere is staggering. The other thing I want to note for the record is as follows: NASA has issued a new ‘cloud chart’ for use in the schools with stunning photos of ‘new’ clouds (New? You mean like ‘new’ kinds of water, ‘new’ kinds of soil…huh? Or maybe they are just newly discovered like species of plants and bugs in the deepest amazon). These are, in fact, chemtrail-made Frankenclouds. Cotton Candy Death. Old movies are being re-edited with chemtrails added to the skies. There are Cloud Appreciation Societies (there really are, everywhere) in which members wax lyrical and poetic about these amazing new cloud formations. One can still look up, if one is old enough and has not succumbed to the chemically-induced dementias ravaging the population, and see that something is very, very wrong in the heavens. Then the Cloud Appreciation folks would issue Ode to Kilroy or some such. Perhaps some of us would ooh and ahh. How I wish I was kidding. I’m not. So let’s talk about the severe impact on our biology instead. The question is, how does all this happen? Because we absolutely must, we are discussing the ways our beautiful and already perfect human body reacts and breaks down and is transformed after being marinated, without relent and without our consent, in an atmosphere that has been turned into a dense, highly reactive electro-magnetic conductor. The plasma we breathe is filled with ionized metallic salts such as aluminum nanoparticles and barium nanoparticles. Arsenic, cadmium, mercury, fluoride…the list is long up to and including human cells such as dessicated red blood cells. Often we see and smell sulfur dioxide, which kicks oxygen off our neuroreceptors and makes us more compliant. The air we breathe should be what we term ‘neutral,’ which simply means that chemistry which is the most naturally conducive to health and life. It is no longer neutral air but rather, as I have indicated, a metallic and conductive plasma. How come? One could insert ‘because of the CO2′ here and most folks, I think, would nod and smile. However, the other stuff in the atmosphere, the other stuff being rained down on us for no CO2 reason, no global warming reason whatsoever…this gives the Lie to that now very pat answer. CO2 is not the problem. CO2 was never, ever the issue. Thousands and thousands of scientists have tried very hard to protest about this to Mr. Gore and to the rest of the world. This is about, rather, transforming human beings into something different, something other than human. I, for one, am not okay with that. We are going to talk about Smart Dust and lithium trails, too, and what follows is from a video which includes a recorded conversation with a NASA scientist, who talk about the lithium in the air from at least the summer of 2013. They are dropping lithium on us, according to a NASA scientist, to understand how the wind blows. Excuse me? Lithium. On us. In our lungs, in our soil, in our water to try to find out how the wind blows at altitude. I encourage you to have a think about the effects of lithium. This is a ‘psychiatric’ drug meant to put us into uber-calm mode. One does not breathe in a nanoparticle of anything without experiencing negative biological consequences. However, it is not the reader who will run with the research ball I aim my conversations at generally. It is the reader who needs to get plain information without being buried under an avalanche because that is absolutely counter-productive. Unfortunately, even the simplest, most plain explanation of why so many of us spend all of our time sounding the alarm is, well, horrifying. There is no other way to put it. First, though, the very basics, now that we know them and can talk about them sensibly. (I want to acknowledge the work of Sofia Smallstorm here for distilling that avalanche of information down to something very manageable and understandable). In general, there are three major categories of material floating around in this air/plasma, all of which goes right into our very willing bodies. The material is designed to do so. We ingest it all, one way or another. The categories are: metallic salts, filaments – generally submicron sized – and engineered biologicals. These categories have been identified using soil, air and water samples collected across the planet. Heavy metals. Metallic salts. Same thing. Aluminum nanoparticles are a very prevalent example of one of these metallic salts. Barium is, as well. The term ionizable metallic salt is very precise here and it means quite simply that this substance not only conducts electro-magnetic impulses but, in agglomeration, creates a plasma that conducts electro-magnetic energy. Agglomeration, as you all probably know quite well, is simply the sticking together of smaller substances to make larger substances. These substances accumulate in the body, going in through the skin and into the lungs since they are much smaller than say asbestos, which is illegal because inhaling particles as such makes one very, very ill. Many nanoparticles are accumulating in our bodies, agglomerating, and are much, much smaller than many substances which have been declared extremely hazardous, dangerous and illegal because they will kill us. Bio-accumulation of aluminum, for example, leads to something we all know as Alzheimer’s Disease. I believe the first statistic I came across regarding aluminum nanoparticles was one collected from snow on Mt. Shasta. Levels were something like one hundred and twenty thousand times higher than ‘acceptable.’ I let the characters in The Sun Thief demonstrate, explain and live with the heavy metals. There is ample information out there at your fingertips if you want more. I recommend searching the name Mark McCandlish, my technical advisor on the book, because he has recorded many, many interviews on the subject and makes it very, very understandable. I also recommend lectures by Sofia Smallstorm and my own interviews from Bewusst TV, in English and German. Once again, bio-accumulation of such makes the human body a nice conductor of electro-magnetic impulses, as well, all the way down to the DNA. Two things I hope you already already asking yourselves. One, since the geoengineering program is supposed to be about cooling the planet, or even protecting us from solar flares, why are we making the atmosphere conductive? Additionally, why are we making human beings conductive, as well? If you want to take it one step further, add the absolute fact that we are living on a planet that has been utterly saturated in e-mag waves. Just have a look at the GWEN tower on every corner, for example, emitting electro-magnetic impulses ceaselessly at demonic levels. The other thing I hope you want to know more about now is this idea of bio-accumulation. What is it? Nanoparticles, for example, do agglomerate…meaning that they stick together, as we know, to make something much bigger. Imagine mucous gathering in lungs when you are ill.
That is the agglomeration of a healing substance reaction to an infection. Some of what they are sending down we are, in effect, assimilating. (I think the Borg are at the door. Don’t answer it). Actually, one way or the other, our bodies are ‘dealing with’ everything they are raining down on us and it is making us very, very ill. What we don’t assimilate, we excrete, which brings me to the nanofibers. Some of these unidentifiable fibers raining down on us are big enough to see with the naked eye and some are submicron level again. They do not exist in the natural world. We know about them largely, I believe, thanks to the poor souls with Morgellon’s Syndrome and the identifier of this biological effect on humanity, Dr. Clifford Carnicom in New Mexico, who risked life and limb to bring it to humanity’s attention. Morgellon’s Syndrome is identifiable when the fibers leave the body through the skin. That is when we see the them, when the body is rejecting these fibers. The scarier part of this, after some thought, is that we all have them. The worse news is, If we cannot see them on ourselves it is because our body is not rejecting them. They are, according to Sophia Smallstorm and Clifford Carnicom, tubules with hollow insides. When they are cultured they produce colonies of filaments. Some of the fibers are tracking mechanisms. Forget the argument about microchipping. It’s already here. Some of the tracking mechanisms are smaller than the eye of a small needle and some, I am convinced, are nanoparticle-sized. This comes under the heading of Smart Dust. We are all breathing Smart Dust. All of us. The nanofibers we are discussing here are self-unpacking and self-replicating once they are inside your body. All of this, may I remind you, is being brought to us under the umbrella of saving us from ‘global warming’ and ‘solar flares.’ An army of pilots is dropping this stuff on us by the ton in the name of saving us from solar flares. What has any of this hijacking of our bodies got to do with global warming? We are starting to understand that we need to stop listening to that nonsense and realize what is being done to us. Because we are being made into entities that resonate with signals sent at us, because we are being invaded by these nano-particles in smart dust, it is impossible to ignore the fact that we are being made into changed and controllable entities. This is truly the definition of Transhumanism, not building a ‘better’ or ‘healthier’ human. Our bodies are already perfect. Our bodies’ natural state is health. We have been convinced that we are broken when we are not. Engineered Biologicals. Category Three. Dessicated (dried) red blood cells. This is in the air we breathe now. Perhaps this is some old home remedy of which I have been blissfully unaware? These have been identified absolutely as human red blood cells but have been engineered in some way to be preserved. The materials showing up in the unidentifiable fibers looks like bacteria, is as indestructible as the forms of cellular life that withstand extremes of pressure and temperature, and are self-replicating like the complex cellular life that make up animals and human beings. Just understanding how we have been modified to resonate to outside frequencies should be enough to set the world’s understanding on fire. Just hearing about the dessicated red blood cells should be enough to make us put the global warming/solar flare line in the rubbish bin where it belongs. They…and that means US as well as THEM… are building controllable, directable humans. They are building entities they can invade, make ill, torture, even kill remotely. Slaves? This is going on all over the world. This is the Pandora’s Box I opened three years ago when a van ran over my mother as she walked to church on a Sunday morning. It all goes back to the hybrid corporate-military machine and their handlers, for there are levels above them, rest assured. For me, it all goes back to the moment when thousands of blackbirds plummeted dead to the earth for no reason we can see with our eyes. This is geoengineering, folks, make no mistake. This is Geoengineering. When I started writing and lecturing on this subject and, I wrote that I would never tell you a story that was an exercise in hand-wringing. I will not do that today. The earth is mighty. The earth can do much to heal herself if we allow her to do so unmolested. That’s Job One. Right on the heels of that, the cessation of all aerosol spraying, should come bioremediation. Let us save our children, our families, our neighbors. This is tough material, I understand that. Raise consciousness with us. Gather the facts and give them to the people you know who respond to data then let them run with it. Present others with the story of Christina, the daughter of the woman who was run over and her compatriot Tim Verzet, the fire bomber pilot who took on the madness in The Sun Thief. Christina’s story is absolutely true for it is my story. However you can do it best, inform yourself right now and start spreading the word. That, I promise you, is what They are most afraid of for there are billions of us and a handful of them. However, time is of the essence. Do it now whatever it is.